Ok, if you haven't gathered by now - I'm kind of obsessed with kale. It's hard to go back to eating 'regular' lettuce in salad, once you fall in love with hearty, flavorful kale. 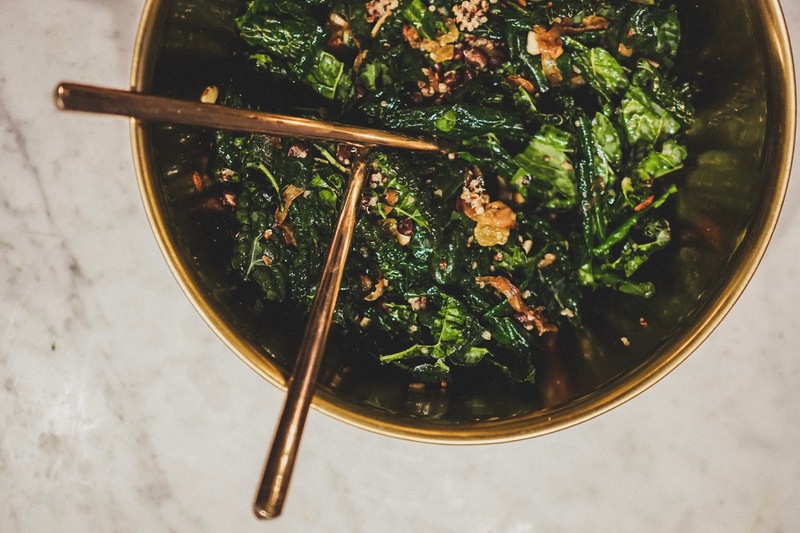 This salad is inspired by one I often order from a favorite local restaurant, Mt. Chalet. You might not expect this sports bar to have a world rocking kale salad, but alas, my world has been rocked! In the restaurant, I usually top the sweet and savory salad with a black bean patty, but for the sake of time and ease, I've swapped in whole beans to my recipe. The ingredients might not sound all that exciting, but I swear, it's a killer combo. I love the play on savory, sweet and tart flavor. Earthy kale, combined with the citrusy bite from the vinaigrette, a sweet pop from the golden raisins and salty crunch from garlicy black beans. It just works! I've written the recipe to be broken down into 4 entree size servings, so it's great to prep ahead for lunches or easy weeknight dinners. Prepare quinoa per the package directions (rinse, boil in 2/1 water/veg stock ratio). Drain and rinse black beans, place in a large frying pan over medium/high heat - add a splash of oil (I used the onion pan after they were cooked - so no additional oil necessary). Toss and sprinkle with garlic powder, onion powder, salt and pepper - making sure are the beans are coated. Cook for about 10 minutes until beans are coated and crispy. Wash, dry, remove stems and chop the kale (one bunch per entree sized serving). 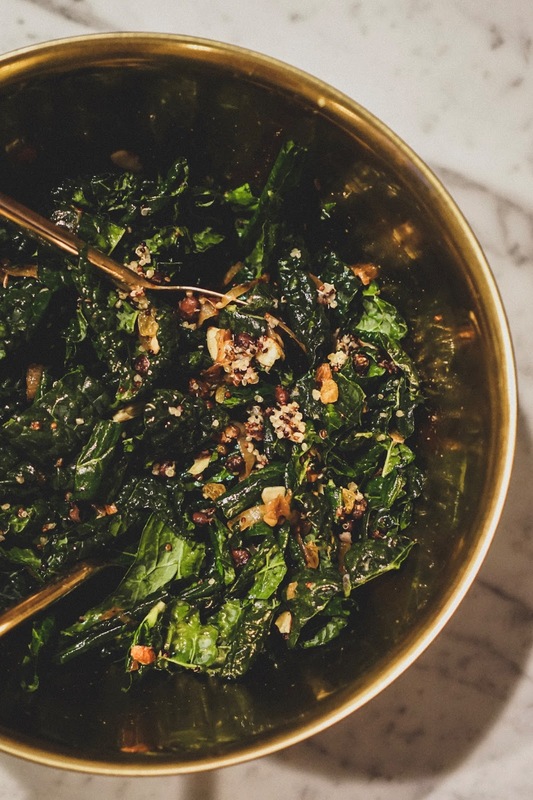 In a large bowl, place 1 bunch of chopped kale and 1/4 cup of dressing - toss to coat. Add 1/4 of the batch each of black beans, quinoa and sauteed onions. Top salad with 1/4 cup each of slivered almonds and golden raisins. Toss to combine, and enjoy!